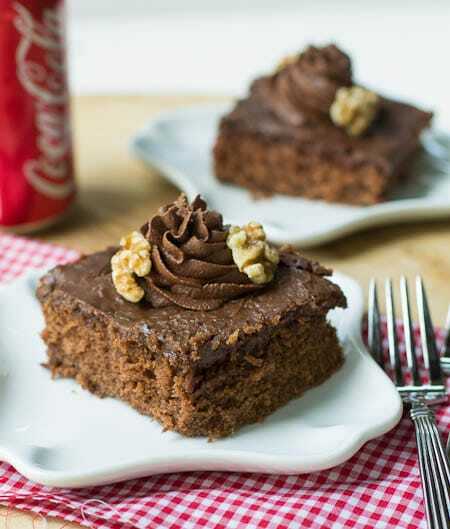 This Coco-Cola Cake is absolutely addictive. And I know because my daughter and I ate the whole thing by ourselves. I had originally made it for a friend’s birthday, but he unexpectantly left town and I couldn’t deliver it to him. My husband and son were in Montana for their annual Man Week, so my daughter and I snacked on it all week long. 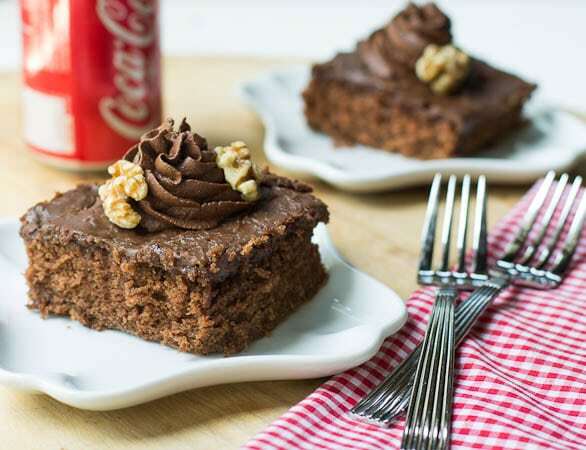 This Coca-Cola Cake is easily one of the best chocolate cakes I’ve ever had, and I’ve eaten a lot of chocolate cake. The recipe is from ChocolateChocolate , my go to cookbook for chocolate recipes. I have never been disappointed with a recipe from this cookbook. There is coke in both the batter and the frosting, and the cola helps produce an extra tender cake. The cake was still moist 5 days later when we ate the last crumb, and I didn’t even have it covered very well since I would grab a nibble practically every time I walked past it. The recipe suggests making a second type of frosting, which I did. It’s very different tasting, much creamier and richer than the cola frosting and compliments the cake well. Plus if you pipe it on using a pastry bag, you can make the cake look much more fitting more a special occasion. BUT- the cake would still be completely delicious without this second frosting. In a medium saucepan, combine 2 sticks butter, 1 cup Coca Cola, and the cocoa powder and bring to a boil. Meanwhile, place flour and 2 cups superfine sugar in a large mixing bowl fitted to an electric mixer and use the whisk attachment to sift them together. Pour the hot Coke mixture into the mixing bowl and mix on moderately low-speed until thoroughly combined, about 2-3 minutes. Mix in the eggs, vanilla extract, and buttermilk mixture. Mix well to combine. Batter will be thin. Pour into prepared pan. Bake for 20 minutes, or until a toothpick inserted in the center comes out clean. Let cake cool for 5 minutes. To make Coca Cola Frosting: Combine the confectioners’ sugar (3 3/4 cups plus 2 tablespoons) and a large pinch of salt in a large mixing bowl. In a small bowl whisk together butter and melted chocolate until smooth. (I melted them to together in a small saucepan over low heat.) Mix vanilla extract into chocolate mixture. Pour the chocolate mixture over the confectioners’ sugar and add the 6 tablespoons of Coca Cola. Beat on low-speed for 1 ½ to 2 minutes, just until combined and smooth. Scrape down sides of the bowl to ensure everything is mixed evenly. Pour frosting over cake and use a rubber spatula to smooth it out. To make Chocolate Cookie Frosting: Place 4 cups confectioners’ sugar and salt into a mixing bowl of an electric mixer fitted with a paddle attachment. Add melted chocolate, vanilla extract, and milk. Beat on medium-low speed for about 2 minutes. Blend in butter 2 tablespoons at a time, beating just until incorporated. Increase speed to medium and beat until smooth, about 1-2 minutes. Scrape down sides of bowl periodically to keep frosting smooth. Note: If frosting is too thick, add additional milk 2 teaspoons at a time (no need to warm this milk). If too thin, add additional confectioners’ sugar. Use a pastry bag to pipe frosting onto cake. Garnish with walnuts if desired. This entry was posted in Cakes, Desserts and tagged chocolate, coca cola cake, desserts, southern cakes, southern recipes. Bookmark the permalink. I make a white cake & add chocolate to the icing, use same recipe for cake & just leave out cocolate. Do you really bake it at 400 degrees? How about adding information on the best way to store these cakes, and how long they can be stored and still taste great. This looks FABulous. I’m in Montana next week for Girls Week with all my friends. 🙂 Want to join me? Maybe we can find us some Coca-Cola cake! 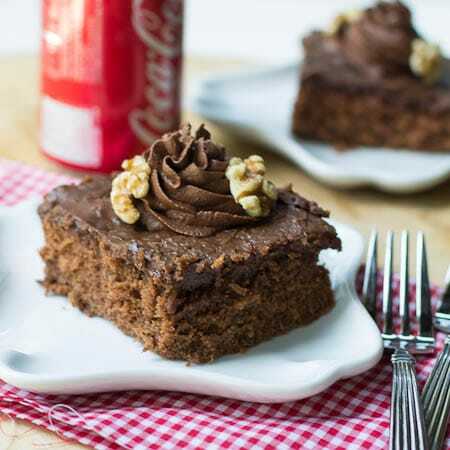 You must try Coca-Cola Cake. The cake does something fabulous to the cake batter! I never even heard of a cola cake but now it’s all I can think about! YUM! This sounds fabulous Christin! I have never baked with coca cola before, such a great idea! Thanks for sharing this with us. 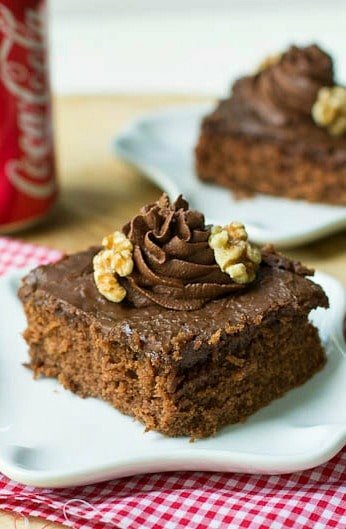 I have never tried a cola cake but it looks incredible! Wow and two different frostings too? Sounds wonderful! Thanks Kelly! It’s about as good as chocolate cake gets! 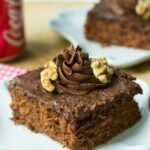 I would have never thought to use coca-cola in a cake – this is so different! And with two different kinds of frosting? Holy yum! Coke + cake??? Say whaaaa?? It sounds crazy, but it looks amazing! It does sound crazy doesn’t it? But oh so good. This cake looks chocolatey and delicious! I’ve never had a cola cake, but it sounds great to me! I have never made a cola cake! I’m gonna try this one!